This disc features music from late sixteenth-century Rome and ranges from Allegri’s Miserere, surely the best-known and best-loved work of this period, to a rarely-performed or recorded oddity. Seven Roman musicians came together (or were brought together) to write a Mass-setting where they each contributed different sections. 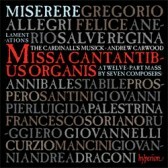 The resulting work, the twelve-voice Missa Cantantibus organis, is a tribute both to Cecilia (the patron saint of music) and to Palestrina. The seven composers each take themes found in Palestrina’s motet of the same name and use them as the starting point for their new compositions. Palestrina himself is among the seven, with Giovanni Andrea Dragoni, Ruggiero Giovannelli, Curzio Mancini, Prospero Santini, Francesco Soriano and Annibale Stabile being the other six. All seven composers were prominent maestri in Rome and most appear to have had contact with Palestrina either as choristers or pupils.